Should you sell your shares when a company starts to underperform? At some point you’re going to buy shares in a company and then that company’s is going to issue a profit warning, stop growing or perhaps even cut its dividend. The question then is: What to do next? Exactly what you should do will depend on your overall investment style. 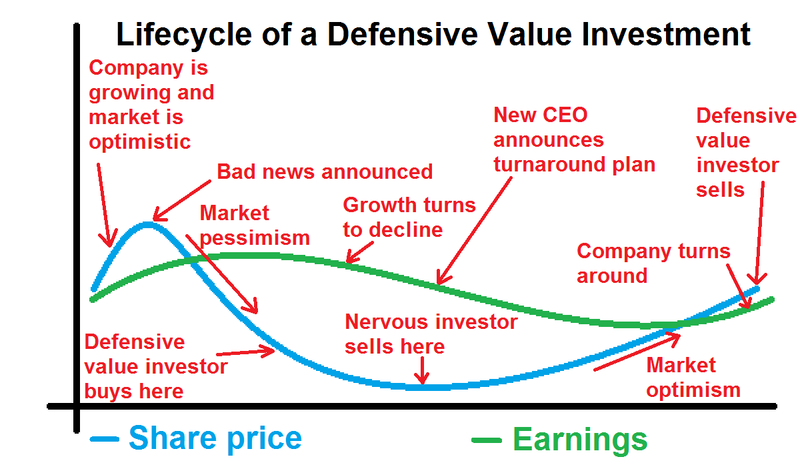 If you’re a defensive value investor like me then in most cases I think it’s a mistake to hit the sell button straight away. Value investing is the art and science of trying to buy companies for less than the true or “efficiently priced” value of their future cash returns to shareholders (mostly dividends and share buybacks). Why would a company’s shares sell for less than their true value? There are many possible reasons, but often it’s because most investors think the company’s future prospects are either highly uncertain or poor. As such they expect the company’s future cash returns to be lower and so the share price falls to reflect this opinion. The key point here is that a company’s share price is a leading indicator. The share price drops today because of investor sentiment about a company’s future results. A good example of this is the recent EU referendum. Immediately after the UK voted to leave the EU (which the market initially perceived as bad news) the FTSE 100 sank below 6,000. Market participants were worried about an immediate recession, which so far hasn’t materialised. What impact did the EU referendum have on company accounts the following day? None, of course; one day is far too soon for any impact to show up. Even now, after a few months have passed, only a few companies are showing any meaningful impact from the vote in their balance sheets and income statements. Given that the actual process of Brexit has barely begun, this should not be a surprise. So share prices fall or rise today because of expectations about the future, but the realities of that future will unfold in their own good time. But the market is not stupid. If the market is pessimistic there is usually a good reason, and many companies trading at attractive valuations do in fact run into fairly serious problems. As a result, value investors often buy “too soon”, i.e. when the share price drops, and then subsequently see the company’s results decline over the next year or two. However, the fact that many value investments go through a period of underperformance is not necessarily a reason to avoid investing in those companies. Because if you pick a fundamentally sound business in the first place then most of those that do run into problems will eventually recover, as will their share prices. I have a feeling I should explain that picture, but hopefully I won’t need a thousand words to do it. The company is growing and the market is optimistic about its future. The company’s earnings and share price are increasing rapidly and everybody is happy. Some bad news (perhaps a cautious outlook for the next year) is announced. The share price starts to decline but as yet the company’s earnings (and revenues and dividends) are unaffected. The market and the media become pessimistic about the company’s future. The share price declines by 50% over the next few months as earnings growth comes to a screeching halt. Value investors begin to buy because the company now has a combination of a solid track record of growth and an attractively low share price. The company is fundamentally sound and value investors assume it can overcome its problems. Over the next year or two the company’s earnings decline. This is the first concrete evidence that the bad news is having a serious impact on the company’s performance. The share price continues to fall and value investors (who typically buy too soon) are now 25% underwater on this investment. Nervous investors sell at the point of maximum pessimism. The company’s earnings and share price continue to decline, everything looks bleak and the company is considered a basket case. The dividend may even be cut or suspended. A new CEO and CFO are brought in. Much of the rest of the board are replaced and a turnaround strategy is announced. The market is cautiously optimistic about the turnaround strategy. The share price begins to climb but the company’s results continue to decline, although this is no longer a surprise. Over the next two or three years the company begins to turn around. Debts are reduced, efficiency and profitability become the centre of attention and revenues, earnings and dividends begin to climb. The share price is rising rapidly as the market becomes more optimistic. The company is growing and the market expects that growth to continue unabated. As a consequence of this optimism the share price and valuation multiples are high. Value investors begin to sell in order to hunt out new contrarian opportunities. Of course this is a stylised account of a defensive value investment. None will look exactly like this, but quite a few will look something like this. Companies and share prices that do well from day one. These are the easiest investments and about half of my investments have turned out this way. Examples are Reckitt Benckiser, Hill & Smith and Cranswick. Companies and share prices that struggle but eventually turn around. These are the ones that are similar to the story above. About a third of my investments go through a multi-year difficult patch but eventually come out the other side and perform well. Examples are ICAP, Greggs and AstraZeneca. Companies and share prices that struggle and are sold at a loss. These are the ones that don’t turn around either sufficiently or quickly enough for me to want to keep holding. These are the ones I want to avoid, although I accept that investing in the occasional loser is inevitable. About one in six of my investments end up this way. Examples are Chemring, Tesco and Serco. The key point here is that if you’re a defensive value investor like me then about half of your investments are likely to go through a multi-year rough-patch, where revenue, earnings and dividend growth is negligible or negative. But, about two in every three of those should turn around and end up as successful investments. So if you sell out when a company begins to underperform the odds are that you’ll be avoiding more winners than losers. Holding: If the company starts to underperform, I’ll hold on. If I bought a good company to start with it should be able to recover within a few years at most. During this period I would probably avoid adding any new money to this investment given the increased uncertainty about its future. Selling at a profit: If the company recovers well and the market becomes optimistic (i.e. the share price increases by much more than the company’s earnings and dividends) then I’ll sell to lock in profits and avoid holding an overpriced stock. Selling at a loss: If a recovery never comes or if the company suspends its dividend for more than a year I’ll sell and move on. I always do a detailed post-sale autopsy in order to learn everything I can from my investment mistakes in order to reduce the odds that I’ll repeat them. Currently the UK Value Investor model portfolio has about eight holdings out of 30 that are in this twilight zone of underperformance. That’s more or less what I’d expect to see. I also expect to see most of them recover and go on to be successful investments. Very good points and a good interpretation of the behaviour in value investing. The one thing you didn’t mention is how long a value investor has held on to the stock and how it plays a part in the decision to sell the stock. For example, if I bought Greggs 25 years ago, the dividend paid out was under £1m. Today, its £30m to £40m and would equate to a yield of 30% or 40% (don’t quote me on that). So, even if Gregg’s shares were to drop 50%-60% the investor would not sell based on the consistent dividends payout. To me, investing is applying the knowledge of the business you are investing and knowing the company’s operations inside out, along with examining external threats to its competitive advantages. If, an investor decides to sell, then it must be because another firm is eating their lunch. Thanks. Funnily enough I don’t really think about things like yield today relative to purchase price (which is what I think your comment is implying). Once I’ve bought a company I try hard not to care what my purchase price was, otherwise you end up getting into the trap of trying to “break even”, or selling if you go too far “below par”. I’m sure that approach works for some people, but not me. Speaking of Greggs though, I wish its price would drop by 50% as I’d love to own it again, especially at that price! You and me, both know that won’t happen, unless Gordon Ramsey enters the bakery business calling it Ramsey’s homemade pastries (a.k.a the best in Britain)! I did a piece on Greggs based on an investing idea called Equity Bond (championed by Warren Buffett). If you were to invest £25k in Greggs back in 1988 when it was turning over £70m and earning £4m in net income, you would have made 103.7% return today in dividends yield! (1988’s dividend yield was 1.97%). Greggs has definitely fitted the Equity Bond description over the years, but don’t be so sure that its price can’t halve from where it is today. When I became a shareholder a few years ago everyone thought it was a basket case; old fashioned, about to be eaten (pardon the pun) by supermarket convenience stores and alternatives like Costa Coffee. Management tried a few re-fit options and one of them worked really well (food on the go) and the wider roll-out has also worked really well. But there’s no fundamental reason why it couldn’t run into problems again and no reason why it couldn’t fall out of favour with investors. At half its current price it would have a 5.5% yield, which isn’t that outrageous. Obviously I’m not saying it’s going to happen, but I think it’s a reasonable possibility. In the mean-time though there are other opportunities out there. Reflected on what you said about Greggs falling by 50% and looked back during the GFC when the UK market loss more than 55%. Greggs, on the other hand, fell by 35%. On hindsight, we need another (but bigger) GFC correction! Good article as always John – down here in NZ, the ‘market price’ often overly reacts to news in the short term. For a long term value / dividend investor this can often (but not always) provide an opportunity to buy the future income at a great discount. Hi FI_Kiwi, yes “time arbitrage” is the general idea, using the short time horizons that most investors have to our advantage. It doesn’t always work, but it usually does, and long may that continue. As usual you’ve made some very good points very clearly. Another thing that some people, depending on their financial situation, might need to think about with a share portfolio is leverage. I realise the most prudent and safest way would be to avoid leverage through margin loans and own 100% of the shares, which is my situation now. But you might need to make use of some of the equity in the share portfolio before the ideal time to sell shares comes up – especially if you’ve bought shares assuming it might be necessary to hold for 5 years or more. For example I’m looking at buying a house in the next few years, in which case it’d be good to use a margin loan on my share portfolio to free up more cash for a deposit. So if I end up doing that I’d have to be careful to leave a safe buffer above the margin minimums to avoid margin calls as share prices in the portfolio oscillate. Interesting point Tim. To be honest I really don’t know anything about trading on margin as I have never done it and don’t intend to either (other than buying a house which is a bit like trading on margin in the UK). Interesting article – I’ve been grimly hanging onto my Tesco shares, I think I’m suffering from a ‘one more year’ syndrome in the hope that things will turn round! Hi Weenie, well if it’s any consolation I think that grimly hanging on is better than panic selling! Also, not sure if you’ve found a new job yet, but good luck with the search/new job (delete as appropriate). Interesting article which I read from a link from your article on regular savings and where to put new money. I am building up my portfolio, usually buying your latest purchase every other month and often one of the existing stocks added from before I joined on sell months. To date I have not held anything you have sold. The problem is about a 1/3 of the stocks in the [UKVI] portfolio are marked as not passing all the buy tests now. However they may actually be more suitable to buy (cheaper) if they are on the early part of the cycle you describe here where they are still dropping before recovery. Frankly I have less concern about existing stocks not passing the tests because of growth, because they could recover. I avoid the bottom 5, and I don’t like high debts. Hi George, actually that 1/3rd of the portfolio that no longer pass all of the buy tests are why I’ve written both of these articles. It came up a few times with subscribers as to why so many holdings didn’t pass the tests anymore, so I wrote this article about how value investments often perform badly for a while after purchase, and that new article about how I allocate new cash, using the fact that some holdings still pass the tests while others don’t as an input when deciding which stocks to top up. As you’ve pointed out, we all have our own preferences, such as you being more concerned about high debts than you are about low growth (I’m the same), but others might have the opposite outlook. Hopefully these articles get people thinking about these aspects of investing. Everyone has a different perspective on what “value investing” may mean I suppose but I think I am more aggressive than most. This question of selling hasn’t arisen for me, if I buy a bargain issue (30-50% of it’s value) I have never come across a situation where adverse developments would impact the value of a company enough to make it a sell. You try to buy when business conditions are at their worst but it’s easier said than done. Holding a company for many years really helps your understanding of the factors that affect it’s profitability. Hi Sam, that’s a good point. I used to be a “deep value” investor, buying stocks that were (hopefully) priced below their liquidation value. In those cases the companies were typically already underperforming badly and often loss making. In those days I used to sell if the price moved back above tangible asset value, either the price increased or because tangible asset value decreased. Usually it was the former (which was good because I’d make a capital gain) rather than the latter (which was not good and usually meant a capital loss). With my current strategy of “defensive value” rather than “deep value”, I’m typically buying companies that are perhaps slightly underperforming, but not drastically. They then often go through a period of more serious underperformance before things get better, and that period is often when selling is a mistake. But thanks for highlighting a different approach; value investing certainly has a variety of flavours.